We spend a lot of time at the RainyDayMagazine office. The chairs are comfortable, the coffee is free, and napping is encouraged. Why would we leave? However reluctant we are to venture out, we do try to make ourselves do it at least once a day. When we do go out into the world, we like to travel light. But traveling light does not mean we go out unprepared. Besides the obvious stuff (cell phone, wallet, keys), there are a couple of gadgets which we always try to remember to grab on our way out: a decent camera, a pen, and a notebook. Cell phone photos and videos are fine for emailing, Facebook updates, and other such activities, but the photos are quite bad compared to a modern point-n-shoot digital camera. We try to have a decent camera with us at all times. Our lightweight camera of choice for the past year has been the Nikon P7000. We like the P7000 because it is one fo the few point-n-shoot cameras with a manual mode. That particular mode does not get used often, but we like knowing we have the option should the situation require that we have complete control of the shooting parameters. The trick to getting the shot is all about control. We used to carry a multi-tool on our ventures (Skeletool, Flux, ZillaTool), but have gone without one for almost a year. Instead, along with the flash drive and car keys on the key chain, we have added a small Snap-On knife. This little keychain knife has been more than adequate for all the cutting needs we required (peeling an orange, opening boxes, etc). Hey, we live in the city. Tools are always pretty close at hand. The notebooks we use are the City Books by Moleskine. We have one for Boston and one for NYC. They have city-specific maps, lots of blank pages for notes, and are excellent for recording thoughts and ideas. We use it a lot more than the digital notepad on our iPhone. 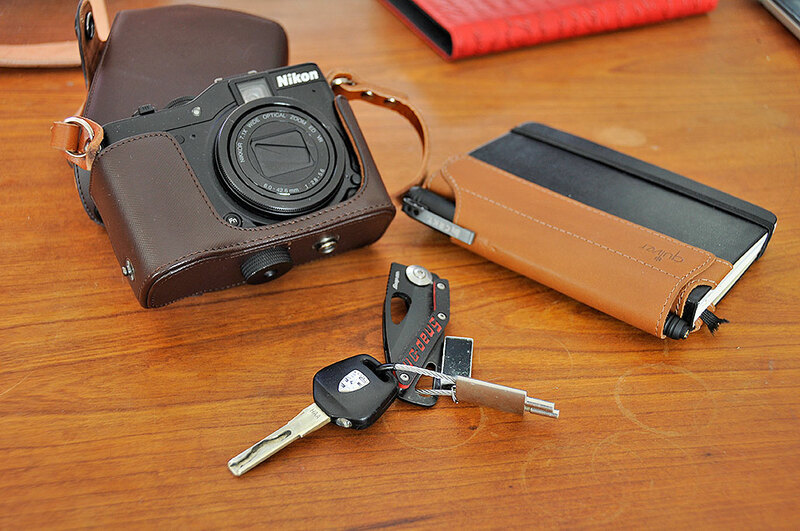 We pair our Moleskine notebook with a leather pen holder called the Quiver. The Quiver is a brilliant product which is both attractive and highly functional. It solves the problem of securing a pen to the Moleskine notebook, an especially vexing concern if you have an expensive or beloved writing instrument. The pen we carry in the Quiver is the CRKT Tao. We like the CRKT Tao pen because it is a great pen for writing. All Tao models are quality instruments which use the Fisher® Space Pen ball point cartridge, a pressurized design developed for NASA. 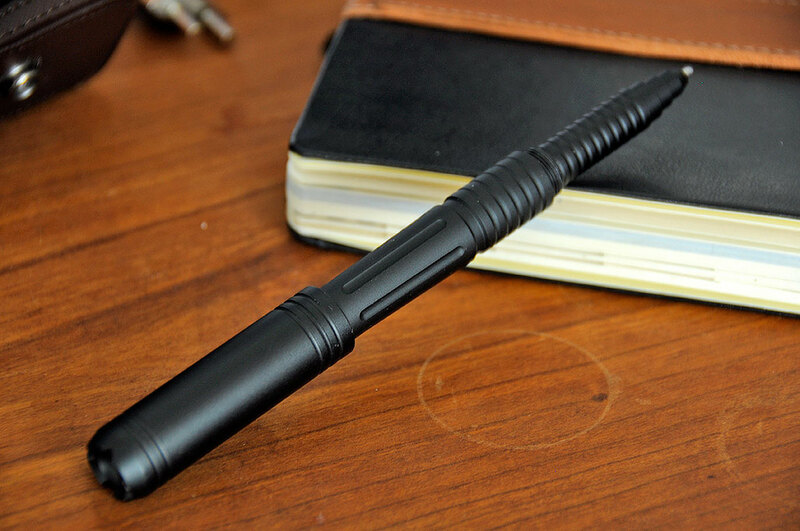 It has a tungsten carbide ball point and thixotropic ink which will write in freezing cold, boiling heat, underwater and at any angle—even upside down. The CRKT Tao was designed by award-winning knife designer Allen Elishewitz. Allen has lived in the Far East and is a martial art practitioner for over 30 years (Okinawan Te, Thai Boxing, Northern Shaolin, Kali). His experience as a Recon Marine, along with the martial arts training, gave Allen an unique perspective on what would make for a practical defensive instrument.